Bob Boze Bell's Big Bad Book of Bad Diary Entries: The Death of An Honest Man: Vincent van Gunfighter? The Death of An Honest Man: Vincent van Gunfighter? As Wyatt Earp strode the boardwalks on Allen Street and dealt faro in the Oriental Saloon, 5,000 miles to the east, a young Dutchman, age 26, made a belated decision to become an artist. The year was 1881, and while Earp had a showdown coming in the fall, and Billy the Kid had mere weeks to live, Vincent van Gogh, who himself had a mere nine years left to live, launched himself on a fiery and ultimately fatal and tragic march into the history books and immortality. That Vincent would eclipse both Earp, the Kid, and even Jesse James, in international fame is a strange note, to me, but the fact that the Wild West connected them all is the most crazy story of all. Buffalo Bill and his Wild West Show came to Paris in 1889 to perform at the International Exposition, or Exposition Universelle as it was billed in France. This was also the festival that premiered the Eiffel Tower to the world. All of Cody's shows were sold out and everyone in Europe was suddenly crazy about the Wild West. 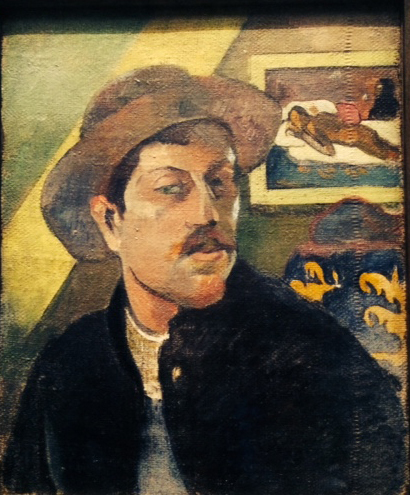 The up and coming artist Paul Gauguin scored tickets and immediately went out and bought a Buffalo Bill hat, which appears to be a Boss of The Plains style chapeau, at least in the self-portrait of Gauguin that hangs in the Musee d"Orsay. So how does Buffalo Bill figure into the death of van Gogh? Read on. 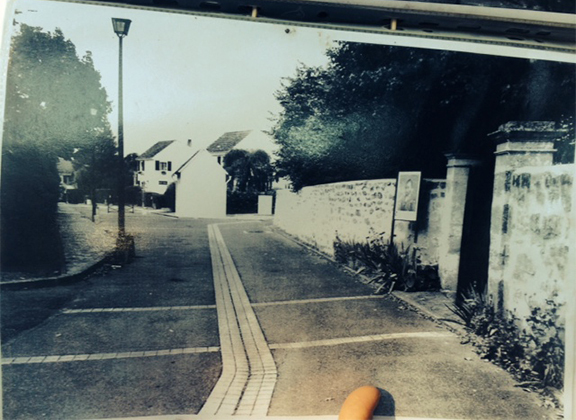 The murder site as it appears today from the Expert's notebook. 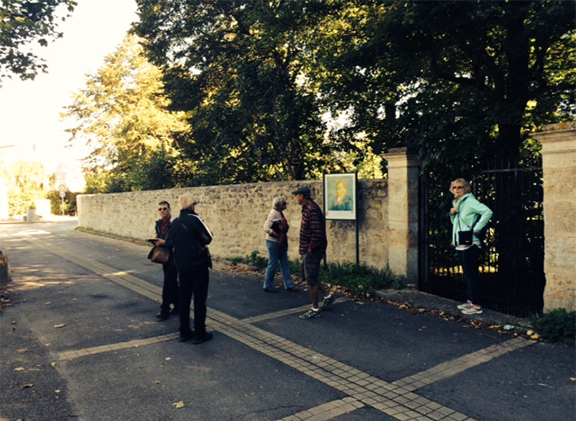 Her finger points to the plaque on the wall, near the gate, at right. After some searching and accosting neighbors in the subdivision at upper left in the photo, we found the site. from left Richard, Bud, Kathy, Dan and Darlene. Now, a few details about the gun that killed van Gogh. This strange looking pistol is of the type that killed van Gogh (the Expert had a photo of the actual gun, same model, which was rusted and falling apart, but I didn't get a photo of it). In the traditional telling of the story, van Gogh borrowed the pistol from the hotel owner, Gustave Ravouix, and subsequently shot himself with it, but, according to the 2012 biography "Van Gogh The Life" by Steven Naifeh and Gregory White Smith, there is credible evidence that the pistol belonged to Rene Secretan, a 16-year-old punk, rich kid who was also enamored of Buffalo Bill and went further than Gauguin, by dressing in fringed buckskins and a big hat with the brim pushed up in front. 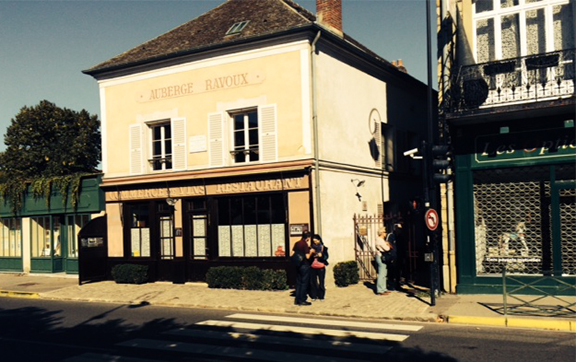 In the van Gogh biography by Naifeh and Smith, it is Secretan and possibly some of his gang who accost van Gogh on the west end of town, near the chateau of Auvers, a large estate owned by M. Gosselin, who actually lived in Paris. According to a renown researcher, John Rewald, who interviewed locals in the 1930s, the actual shooting was precipitated by "young boys who shot Vincent accidentally" and that they "were reluctant to speak up for fear of being accused of murder and that Van Gogh decided to protect them and to be a martyr." This is borne out by the gendarme's (the police) question of anyone else's involvement, to which Vincent replied, "Do not accuse anyone; it is I who wanted to kill myself." After being knocked unconscious by the shot, Vincent allegedly awoke at sunset and walked back to the Ravoux Inn and went up to his room. When Theo arrived the next day from Paris, he found Vincent sitting up in bed smoking his pipe. Incredibly, he lived for two days before expiring. 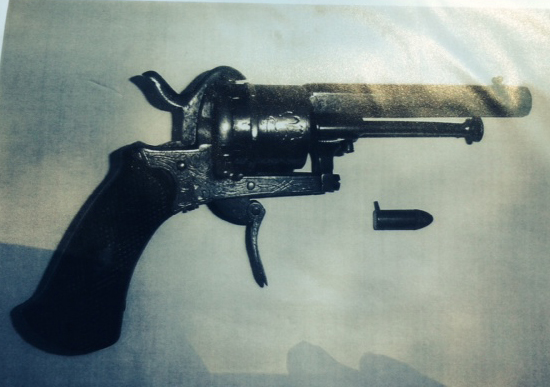 The gun in the photo is a pinfire revolver, of the Lefaucheux system. It took the metallic cartridge (below it) that had a little pin where the hammer struck to detonate the round. These were also called "Teat Fire." If it is small and not the size of a Colt Peacemaker, but more like an 1849 Pocket Colt or similar size, it looks like it might be the Belgian-made "Guardian" or "Guardian-American Model of 1878" with a folding trigger. That's about all I can tell you at this point. Did it shoot off Van Gogh's ear? ha ha. 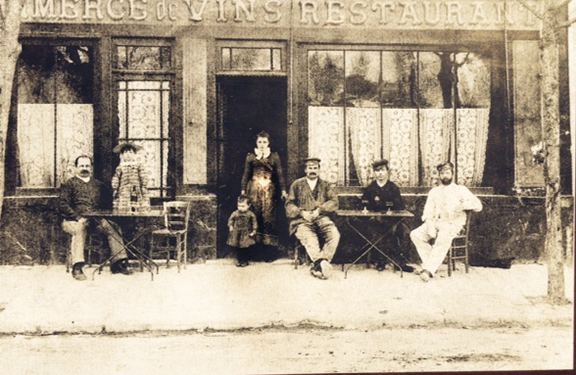 The Ravoux Inn in 1890 with the owner Gustave Ravoux sitting at far left. The girl in the doorway is his 13-year-old daughter Adelene, who is the source of the accepted version of Vincent's death. As she got older she retold the story, adding new and longer quotes. Not unusual for oldtimers: "every time they retell the story, they get closer to the center of the stage." Here is the hotel as it appears today. The Ravoix Inn as it appears today. "It has always seemed to me that suicide was the deed of a dishonest man." In this particular book on this page (links below) shows photos of the rusty gun photo you referred to, maybe..Found in a field years later, etc..Copy & paste links, below..
Rusty gun (same page another link)..Scroll down on the page..